The Executive Lounge at Antigua Airport is the only lounge at this relatively small international airport serving the Commonwealth of Antigua and Barbuda. For departing visitors, it offers a surprisingly pleasant oasis prior to boarding one’s flight. 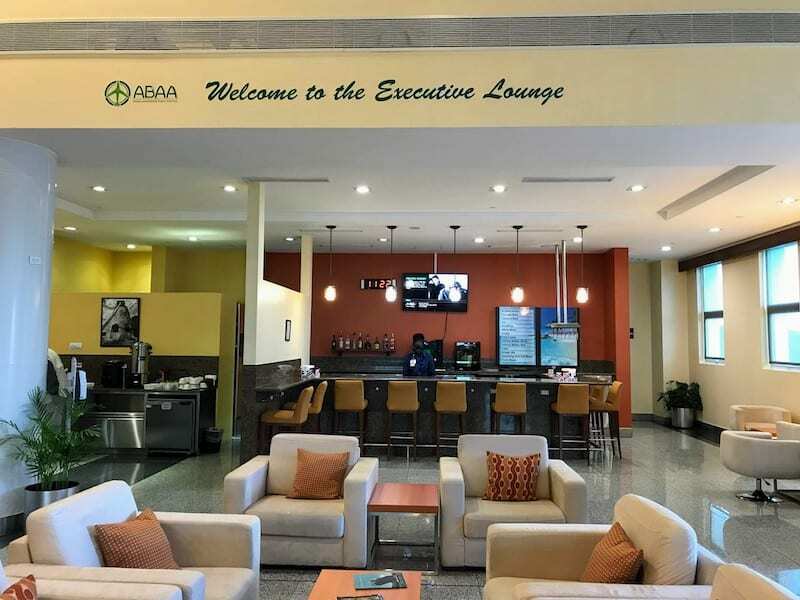 Operated by the Antigua and Barbuda Airport Authority (ABAA), the lounge is extremely spacious given that fewer than 1 million passengers fly through V.C. Bird International Airport (AUN) each year. The lounge is relatively new; it has only been open since November 2015. Visitors to the Executive Lounge can expect to find a quiet place to relax with comfortable seating, electrical outlets beneath each of the table lamps, and some light refreshments and beverages. During the few hours we spent there on a Monday morning, there were very few other people in the lounge. Paintings by local artists grace the walls, adding a Caribbean flavor to the setting. The restrooms, while institutional looking in décor, were immaculately clean. Priority Pass members, Diner’s Club members and passengers flying on British Airways, regardless of class of service, have free access to the lounge. One-time lounge passes can also be purchased for $60 per person. The cost for children between 2-12 years old is $30. No cash is accepted (only Visa or Mastercard). To find the lounge, go through security (which is on the second floor of the two-story modern airport building), then turn left to the very end of the terminal and you’ll see the lounge door on your far right. A receptionist named Ivy greeted us warmly at the front desk and explained the lounge amenities. She handed us three tiny tickets each that were good for complimentary alcoholic drinks (local wine and beer). She told us that free soft drinks and juice were unlimited and that mixed cocktails were available at an extra charge. A small alcove displayed a variety of serve-yourself snacks including mini beef sliders, jerk chicken kabobs, cheese and crackers, fresh carrots and celery sticks and salads. In addition, there were a couple of desserts and hot beverages (tea and coffee). The friendly lounge personnel were fastidious about cleaning up plates and offering assistance. Unlimited access to high-speed Internet is also complimentary. However, one of the lounge’s nicest and most unexpected amenities was the oversized outdoor deck, offering shaded seating with views of the ocean. Caution: Although giant monitors inside remind passengers of their flights, spending too much time on the sunny deck may tempt you to miss your plane! NB: Before heading to an airport, we typically use the Lounge Buddy app to identify lounges and check on the entry requirements. However, at the time we visited the Executive Lounge in Antigua, there was no lounge information available for this airport. The info read: There are no LoungeBuddy purchasable lounges available at this airport. So we were so surprised and happy to find it after arriving at the airport. The terminal at the Antigua Airport has two floors. Check-in is on the first level, passport control and security are on the second level. A few fast food restaurants and shops are also on the second level. We flew on American Airlines out of Antigua and arrived at the airport at about 9 AM after disembarking from a ship. Upon our arrival, we found out that the American check-in counter didn’t officially open until 10:30 AM, although it actually opened at 11 AM. Seating on the first level of the airport is extremely limited.